Yesterday, we had a good look at the Apple Watch. And when we were done with that, we turned our attention to the Android Wear tickers adorning our wrists. We've grown pretty fond of them in the span of a few months, but we're also objective - Android Wear is work in progress. Lurking beneath the pretty watchfaces, there are the rough edges, the questionable omissions, the "playing-it-safe" feel of technology that was put on the market a little bit early. Nothing deal-breaking, but we have to say, Apple really took its time with this project. In the process, it came up with some nice ideas about the Apple Watch's functionality that Android Wear developers & Google should borrow if they want to see the platform progress. Android Wear does not support Wi-Fi connectivity at the moment, which is mildly annoying. Here's an example - Lord forbid you leave your smartphone on the desk and leave to use the restroom! Some 40 meters on your way to business, the watch loses connection to the handset and goes buzz-nanas - like "OMG, did you lose your phone or something?!" Huh, does it really have to be like this? What keeps the two from staying connected over the in-house Wi-Fi? Additionally, Wi-Fi connectivity would be of benefit for app installs, side-loading, development, and smartwatch apps & tasks that could use a faster connection - take the Wear Internet Browser, for example. Thanks to NFC, the Apple Watch is tightly integrated with Apple's mobile payments system and it could interact with optional gadgets and accessories by virtue of this connectivity. But there's a difference here - Apple has an actual, marketable, profitable use for NFC support. Google doesn't have a payment system and by the looks of how its Android Pay platform is shaping up, big G is sidestepping the card-less payment market in favor of advancing Google Play purchases. However, NFC will probably make it in Android Wear down the road. Right now, Android Wear lacks a reliable song identification app like Shazam or Soundhound. Alternatives like EchoWear and Sony TrackID are plagued with issues - the former disappeared from the Play Store, the latter doesn't show up on the watch, and vice versa. Last we heard, Shazam was "looking into" Android Wear... a year ago. Come on, what's taking so long? Looking at the Apple Watch interface going through its motions, we couldn't help but notice how lively and animated it seemed. The watchfaces move exceptionally smooth, the apps' menus and elements are meticulously animated and rich with color and detail. The whole thing is very eye-pleasing. Android Wear - not so much. Google's cards are quite sympathetic, but all they do is show up on the screen and disappear as you casually dismiss them. There's little on your Android Wear watch to really intrigue you into toying around with its touch-sensitive watchface. We know, that's Google's vision for Android Wear in the first place - minimalist, quick, non-distracting, and useful. Curiously enough, Apple has a similar mentality - it expects you to interact with watch apps in 10 second bursts , but it also made sure they are very aurally pleasant 10 second bursts. Step up your UI game, Google - we like our wearable eye candy! Apple's force touch touchscreen discerns between light and firm taps, which seems like a pretty useful invention - it expands the simple usability mechanic of tapping with even more possibilities for interaction without altering it or otherwise mingling with it. It's pretty great technology - it's even good enough for the next iPhone, rumors say, and we think Android Wear is more than a worthy candidate for adopting it. The Apple Watch lets you respond to notificationsand messages by tapping a patern or drawing something on your screen, and beaming it over to a friend of yours' Apple Watch. It's less cumbersome than typing, more accurate than dictating a message, and nobody else but the recepient knows what you wanted to say with the pattern. It's a cool feature that we hope someone will code into Android Wear or a 3rd party Wear haptic messenger app. After all, AW watches already have touchscreens and vibration motors, so the hardware base is covered! The heart rate sensor on the Apple Watch is second to none in the mobile devices category. Dissatisfied with the simple units found on today's smartphones and wearables, it built its own solution with four - yes, four - lenses on the back of the watch to facilitate accurate heart rate measurements. The sensor on your smartwatch right now is halfway between a toy and something actually usable in comparison. 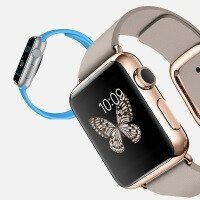 We are impressed with how Apple developed and priced the three different Apple Watch variants. If Android Wear watchmakers - and smartwatch makers in general - want their products taken seriously, we think they too should offer different personalization options and price points to consumers. Take the gorgeous Huawei watch for example - its alleged price of $1000 makes it strictly a luxury watch. What if Huawei made the same pretty and functional watch out of more mundane materials materials, and put it on sale for $250 with different color options. Sounds more appropriate than going full-on after the wealthy types. PA, how do you even know it has an accurate heart rate sensor? Did you compare that with a an actual HR device? All heart rate sensors are fairly accurate, you can even use your camera as a sensor as shown again and again and it is fairly accurate. This is largely a fluff piece for Apple once again, because they have to feed their kids too. 1) Wifi, yea, they can add that, wouldn't be too bad. 2) NFC for payments, no thanks, NFC in general sure. All android phones have NFC (like 99%) so payments through the watch are just stupid since most authentication requires the phone. Only Apple needs this for payments seeing has how the 6/+ are the only ones with NFC. 3)Shazam....okay, they'll have it soon enough, maybe even before the Apple watch since that isn't out yet. But is anyone going to be identifying music on their watch? If it needs the phone to function then why not just use the phone and find the song and DL or something. 4) Animations....on a watch with limited battery, no thanks. Keep it practical, no one needs slow animations like on the iPhone wasting time and battery on the watch. 5) Force touch, no thanks. No need for hidden menus and 10 different functions not intuitively visible. it literally just takes long press and replaces with a gimmick yet accomplishes the same thing. 6) Comm with heart beats....no thanks, keep the gimmicks to Apple stuff. 7) Heart rate sensor....I think some already have it and its just as accurate. 8) More choices....are u F'in with us or something? In response to point 8, did you happen to read the article in the below link? http://www.phonearena.com/news/Motorola-exec-Apple-charges-outrageous-prices_id66163 It's about Motorola's response to Apple's Chief Designer when he was quoted saying "I believe that's abdicating your responsibility as a designer," in regards to Motorola's model of giving users options in making their phone look the way they want it to. Talk about the height of hypocrisy. But you know, they say that imitation is the greatest form of flattery, and with the latest iPhone and iOS release, the Android developers and OEMs should be really flattered. Option 4 UI doesn't matter, especially since Android Wear gives you the ability to add launchers for even Android Wear. You could even design a watch face to add a new UI if you really wanted to. if you really wanted to. But as far as Google redesign their UI. They could but its quite functional as is, and when you change allow your users to change the UI. Then it becomes a moot point for Android Wear. BTW does Apple let its users change the UI? Well we all know the answer to that question. The answer is a definite NO. Option 8 has to be a joke, especially since there is currently 8 completely different smart watches for Android Wear (LG G Watch, Gear Live, Moto 360, LG G Watch R, Asus ZenWatch, Sony SmartWatch 3, LG Urbane, Huawei Watch). The Apple watch comes in a his/her sizes, but they are the exact same design. The only thing that changes is the materials and the bands. The Android Wear smart watches range from square to round, and the vast majority of them are stainless steel, and are much friendlier on consumers wallets. Not to mention you have tons of options for the bands. If you don't like the bands that some of these Android smart watches offer, then you can buy regular watch bands from your local jeweler, or from Amazon, or where ever you can find a regular watch band that will fit. With Apple your ONLY choice is to get the bands from Apple. They charge $50 for a rubberized band. You can get good leather bands for less then $50. Not to mention you can get some stainless steel bands for less then $50 as well. Apple charges $200 for a stainless steel band. BTW the Sony SmartWatch 3 has WiFi and built in GPS. Really? Are you kidding me then tell that to Sony smart watch 3. This the time that PA highlights everything about apple even the most irrelevant ones. One thing is for sure it reminds me of ipod nano. Yeah I've got one too. We dont have superficial arteries on our back of the forehand to make it accurate.2 arteries,radial and ulnar and both are on the medial side of the forehand. If you want an accurate senzor build it on the watch belt so it can be in contact with the arteries. Whoever wants to send me their pulse is a creep and/or stalker. No thanks. Nope. Apple said so, so it's truth. The only accurate read of a heart beat is the Dr using a monitor. I would say, your pulse is an echo of the actual beat. It is delayed. With regards to Slide 3, doesn't Google Now on Android Wear recognize songs ? Why do you need Shazam if Google does. Imao omg phone arena how much did apple pay you to write this.you are clearly kissing their a$$.Android wear should copy icrap whose price is $10000.Seriously have you even held that $h*t in your hand.Every features are on this list are clearly great only in your opinion and especially the last one which is complete trash since you were running out of ideas. Most Android watches don't have WiFi connectivity. It's soarly needed if you're transferring music to the watch. I think that's the only thing listed that's useful. Actually, most do have wifi connectivity. It's just enabled in Android Wear itself. But there will be an update to Android Wear very soon to enable it. More fashion choices? Apple should give its users more choices than broke and bankruptcy. 1. Yeah if you want the 18h battery. 2. Payments are quicker with the phone. 3. Hm...No. Useless. 4. Depends on the taste. 5. Force touch is missing one thing - force back. 6. You are kidding me. Right? 7. How good is that one? Not that I need one. 8. Doesn't Galaxy Gear S use standard strap holders so you can switch to any f&♤♡ strap you please. Now that is a fashion choice. Not that I need one. I am happy to have a Tizen watch like Samsung solo. I have nearby all those features and much more. The earth rate monitor of the Solo can't be more accurate so Apple invented nothing. On this watch Apple copied Samsung so much that it's embarassing. Samsung should sue Apple, in Korea, to win, like Apple in USA. So what is it? Luis D... Do YOU FEEL this way about the apple smart watch or does everyone at Phonearena have the same exact brain??!!! Its not just him who does this either, why does every Phonearena writer put "we" for everything with an opinion? I definitely don't agree with everything you say so stop saying we were this and we were that it's actually quite annoying!! Sure there's the comment section but I come here to see people's personal opinion versus mine but when I read an article its like that's impossible to accomplish because I can't tell if ALL Phonearena is Bias or just a big portion is with all that we crap flying around. Please speak for yourself thats all I'm asking is it really that hard? LMFAO, "communicating" with pulses. Right. We have things called words that work fairly well, you know? This article is absolutely useless.